French sculptor. He was the son of a joiner, who sent him to Paris to train with Jean-Baptiste Pigalle. In 1757 Attiret was in Rome, where he received a prize from the Accademia di S Luca; returning to Paris, he was accepted as a member of the Acadmie de St Luc in 1760, and was a professor there. He exhibited several times at the Salon of the Acadmie de St Luc: among the works that he showed was Roman Charity (terracotta, 1726; Dijon, Muse des Beaux-Arts); Hannibal Preparing to Take Poison (terracotta, 1764); and the Chercheuse d esprit (terracotta, 1774; Dijon, Muse des Beaux-Arts; marble version, Paris, private collection). 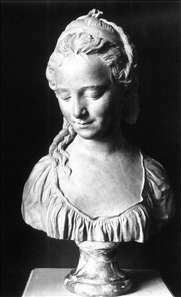 This idealized portrait bust of a young woman, graceful in concept and mischievous in expression, is his best-known work. See more details about "La Chercheuse d'esprit"